Mexican cuisine is riding such a high wave these days. Compared to when I first moved to the US, 20 years ago, you can now find all the ingredients you need to prepare Mexican food. People are not only eating Mexican food out, but are bringing it into their home kitchens. There’s the #tacotuesday and the #taconight. Wherever you travel to in the US, there’s Mexican food to be found in airports, restaurants, hotels, fast food chains, and the offerings continue to increase and get better. It seems like the more people get to know Mexican cuisine, the more they want to taste it, to cook it, to explore its depth. It is such a thrill to be part of this movement. I particularly enjoy traveling through the US to cook whenever I get an invitation. And I was beyond ecstatic when I got the request from the James Beard House in New York City to whip up their Cinco de Mayo dinner. What an honor! But of course, the pressure was on. What theme, which menu, what drinks? So much to share! To be sure, Cinco de Mayo is not a big celebration in Mexico. It is a somber occasion honored in the state of Puebla, where the Cinco de Mayo Battle took place in 1862. It was a battle between a small Mexican militia against a big French army, and while the Mexicans won, with the odds stacked against them, the French won right back. Yet, move the clock forward a few years and Mexico regained its Independence. Now, for whatever reason, which many have unsuccessfully tried to explain, Cinco has become the biggest Mexican-themed party abroad. I was bewildered at first when I started getting invites to Cinco de Mayo parties from our American friends. But then, of course, happily joined the excitement of the Cinco train. Listen, if there is an open door to celebrate anything and everything that we love and are proud of about Mexico, and share our food, cuisine and culture: count me in! 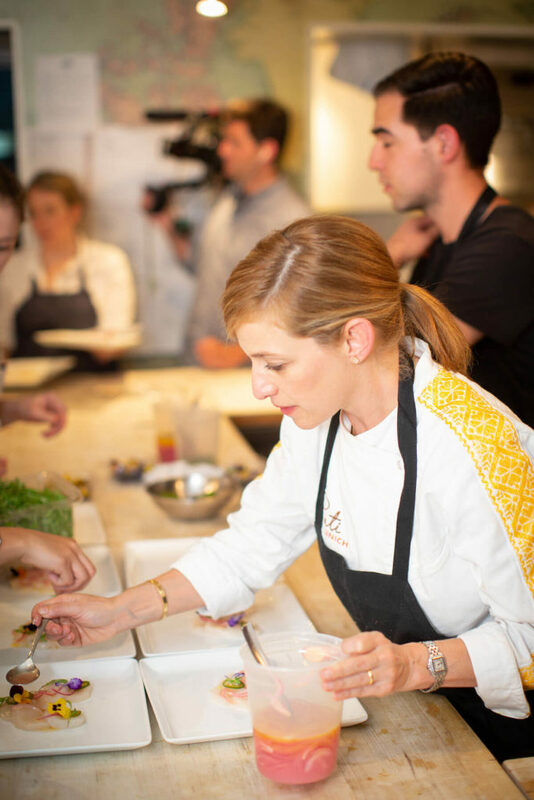 As a Mexican immigrant, to be invited to the James Beard House, such a prestigious place and institution, made me feel proud and like my food is worth it. But, it also made me feel like Mexican food has really started to earn its rightful place in the eyes of the culinary world of the US. 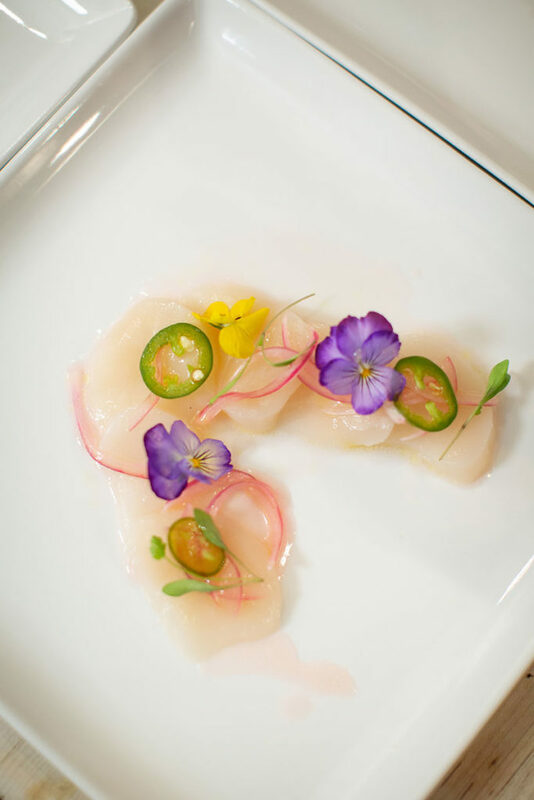 The first course of the formal sit-down dinner menu, after the cocktail hour, was a scallop aguachile inspired by the coastal region of the Sea of Cortez. The team from the James Beard House is a joy to work with. We prepped the day before, as it was a long menu! Then my production team and I got so excited with the occasion that we decided to make it part of an episode of the next season of Pati’s Mexican Table, which will premiere in September 2018. But meanwhile, I leave you with the scallop aguachile recipe. It is SO GOOD. And it could not be simpler. It helps break so many myths about Mexican food. Not all Mexican food is fried, or laborious, or covered in cheese, or severely spiced up, or takes forever to prepare. In fact, most Mexican food is healthy, soulful, delicious, nutritious. It gives beautiful ingredients, like the plump, silky and sweet fresh sea scallops a chance to shine by just dressing them beautifully, lightly and kindly. Mexican cuisine is indeed riding such a high wave today. And I can see the high tide ahead, with the wave getting even bigger and higher. So excited and honored to have the possibility to continue to ride it and bring the fruits of this journey to your shore. In a bowl, combine the lime juice, olive oil, onion, serrano and salt. Whisk and let sit for at least 15 minutes, or cover and refrigerate up to 12 hours. When ready to serve, remove lime juice mix from the refrigerator. Slice the fresh scallops thinly and horizontally, up to 1/8” width. Spread on a platter. Whisk the lime juice sauce and pour in its entirety over the scallops, arranging so that the onion and chile are spread evenly throughout. Serve immediately. Congratulations on your James Beard award. Your Scallop Aguachile looks beautiful and delicious. I can’t wait to prepare it. Thank you for sharing. Oh thank you so much Kathleen! Cada programa que veo es un verdadero regalo de una mexicana a muchos mexicanos; eres autentico orgullo para Mexico y todos nosotros que vivimos “lejos de la tierra donde nacimos.” En verdad, no se pierde la añoranza por la tierra natal aunque se reconozca las oportunidades por mejorar la vida que este país norteamericano ofrece. Aprender como cocinar sabroso y lo que es originario del país natal es un deleite para el paladar y el espíritu. Congratulations Patti on your award. I have been a professional chef for 20 years and Mexican cuisine is one of my fave to prepare. I have travelled to Mexico and Central America extensively and love exploring the cultures and their food. You help share this with all your viewers. I feel like I am your soul sister in the kitchen….. Your chef jacket in the photo is amazing!!!!!!! Do you sell those through your website???? Thank you so much Debra! There is a woman named Zoraya Robles who makes the jackets. I hope you keep having many more fun kitchen and travel adventures! 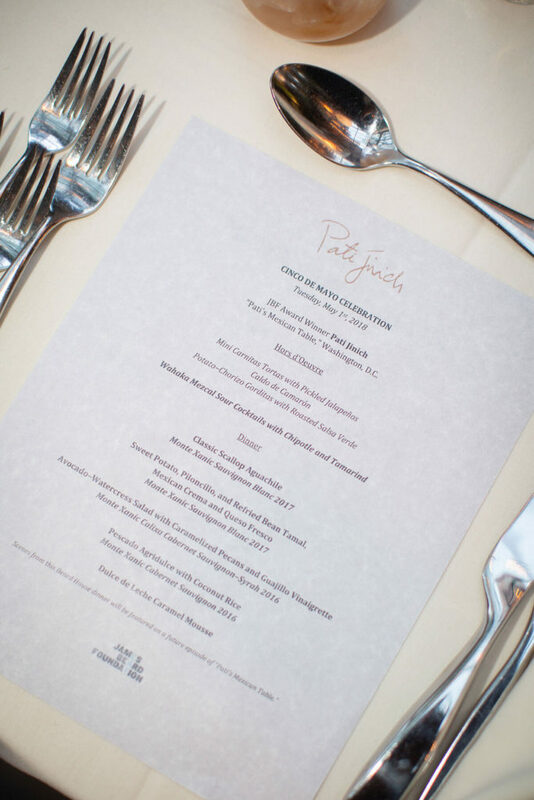 So happy you were at the James Beard house, it’s amazing to be there and be a guest there. Oh it was such a great time! You eat this raw? This looks very tasty! It’s raw and super yum! Congrats on yr JB award! Live watching you cook great food! Can’t wait to see more! I can’t wait to share more with you, Ramona! You are such an amazing woman! I love watching you and your family. Congratulations on the JBA! It doesn’t surprise me, you’re an amazing chef! I hope to be able to watch you for many, many more years to come! I hope to make many more years of the show…thank you, Carolyn! I’m so excited to share my Baja travels with you, Jimmy! Felicidades Pati, eres un orgullo para Mexico y los mexicanos. No se si tu publico incluye a muchos de notostros, espero que si. Me doy cuenta de que la mayoria de tu publico es stadounidense y me da gusto que muchos estan conociendo lo que es la autentica comida mexicana. Y no solo eso, tambien estan conociendo la riqueza de nuesra cultura. Felicidades de nuevo por tus exitos y felicidades tambien por tu hermosa familia. Un abrazo. Uy mil gracias, Martha! Un fuerte abrazo. Pati: Congratulations to you on winning the JBA. So, so very well deserved. Thanks for sharing your knowledge of, and passion for Mexican food traditions and culture. Oh thank you so much Tom! This appetizer sounds like a wonderful version of ceviche. It is light, flavorful and made easily! This sound so delicious! What type of scallops do you buy, since they are raw? I like to use fresh sea scallops. We so enjoy your show, Pati. Congratulations on receiving the JBA! We have family in Monterey. Have you had the Cabritto from there? That could be a wonderful show. Not many Americans have experienced this culinary treat. I keep asking for it in the restaurants that I go to, but not many know of it. Yummmmmm…I’ll try to work on a recipe. CONGRATULATIONS Patti! My husband & I love watching your show, & always felt your personality & your cooking shined beyond the traditional cooking shows! We also love seeing your sons when you have them on to help & /to enjoy your food. A most well deserved win of this significant award, & looking very forward to your toad trip! Muchas felicidades, you are hard working and persistent and it shows. I’m glad it paid off by being recognized amongst the culinary elite. Keep being so warm and making recipes look easily achievable. I’m so lucky to have three such amazing boys and a husband who loves to eat my food and travel with me. And say hi to your soon for me! love the dish as well as you. Congratulations on your, much deserved, JBA! I love how effortless and accessible you make your homestyle recipes for your boys. Pure gold. And your trips to various parts of Mexico highlight the different flavors, styles and ingredients creating a culinary palette so we, the viewers, can travel with you with our palates. Thank you. I can’t wait to try this recipe with some of our giant Alaskan scallops. Oh I can’t wait to take you on more travels, Keith….and enjoy the aguachile…those Alaskan scallops sound yum. Congrats on your James Beard Award. Love your show. Love you . Watching your has opened my eyes and taste buds to the world of Mexican food and what it is all about. Thank you Pati. I’m so happy to hear this, Susie! Thank you. Oh say hi to your whole family for me, Susie! Congratulations I’ve enjoyed watching your programs and looking forward to your new series. Scallop Aguachile sound wonderful but I’m not so sure about eating raw seafood. Congratulations on your JBA Pati! I love your show and I love how you involve your children to assist you. You, being Hispanic, a woman, and a successful chef in the culinary world that is mostly dominated by men, you are an inspiration to me and I’m sure to many others. I love the recipe and cannot wait to try it out!! MMMMM!! God Bless you and your family. Aww thank you Gabby for your wonderfully kind words! Congratulations!! It was well deserved. We look forward to seeing the next season of Pati’s Mexican Table. Best to you and your familia. Thank you Noel and Naomi! Congratulations on your award!!! You are not only special you are the best! I enjoy you, and your family, I have learned sooooo much from you even though I am Mexican, You are one fantastic LADY!!!!. hope you are with us for a long time. Enjoy everything you do. Felicidades!!!! Recipe looks so good, can’t wait to try it! Congratulations on you James Beard award! Thank you James! I hope you love the scallops. -Mis recuerdos favoritos de vacaciones, comiendo mariscos frescos de la costa Pacifica….Nayarit, La Paz, Mazatlan, Puerto Vallarta….Acapulco! Adelante Patti! Nice Job! Felicitaciones! I can not wait to try this! I wish I were in my kitchen right now cooking this and watching your show. Felicidades on your James Beard Award!! I’m not surprised at all that you won. Estoy orgulloso de mostrar sus libros en mi cocina!! Los mejores deseos para usted y su familia! I want to thank you for all the wonderful recipes and letting us into your home and life. My husband and I really enjoy your show and your family. Thank you for welcoming me into your home, Kelly. The scallops are served raw….I hope you love the recipe. Congratulations!! I’m so excited and very very happy for you. How wonderful!! Just wanted to congratulate you on your James Beard award. I bet when you first arrived in the US you never heard of JB, let alone thought you would ever win something so wonderful! Keep up the good work, wonderful dishes and stories and most of all how Mexican food is the soul of your beloved home and country! I can’t wait to share my Baja road trip with you! Can I use frozen ocean scallops? For this recipe, fresh is really best. Hi Pati! I am a huge fan of yours! I have never cooked with scallops but enjoy eating them at restaurants. 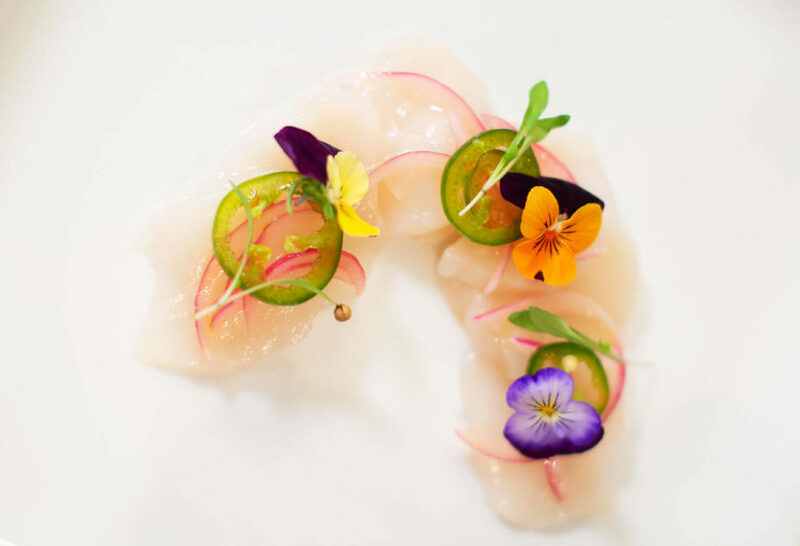 The scallops do not need to be ‘cooked’ in the lime juice mixture first, like ceviche? Thank you. No need to cook the scallops in the sauce….just dress them and enjoy! Hola Pati.. Congratulations on your James Beard award! So happy for you! Hola Pati! I’m an avid fan of your show. I’ve noticed most shows on Mexican cooking focus on either Oaxaca and the Yucatan. I’m interested in discovering cuisines from other regions. How about featuring foods of Veracruz, or the Pacific Coast states, or Northern Mexico? There’s so many other regions that deserve exposure! I’m especially curious about Veracruz since that’s one region I haven’t been to. I hope you’ll consider this suggestion for future shows. ¡Mil gracias! Oh thank you so much Nancy!